Discover a new yuletide tale as the Steel City is covered in a blanket of white. Cardia encounters more dashing literary characters – new friends and foes. Strengthen one relationship or choose to court multiple gentleman at the same time to let chaos reign! Uncover fresh intrigue as Cardia delves into the mysteries of her own family and the dashing suitors. 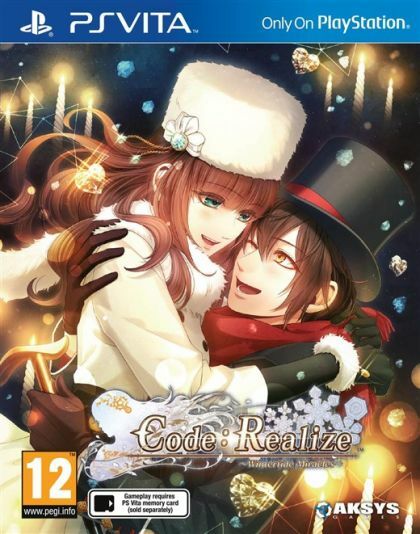 The story begins with the main character, Cardia, isolated and alone in a mansion on the outskirts of a 19th century steampunk version of London. A victim of a mysterious affliction that makes her blood a virulent poison and her touch instantly lethal, Cardia is shunned as a monster. Through a number of events both grand and seemingly insignificant, Cardia is pursued by the Royal Guard, kidnapped by the gentleman thief Arsène Lupin, and joined by a myriad of other handsome figures out of the best of western literature. With her new-found friends (and suitors) Cardia ventures out in the world to unravel the mysteries surrounding her very existence. Experience the magic and chaos of a two-on-one date. Play with dynamics (and hearts) by bringing multiple members of Lupin's gang on a wide variety of romantic romps. Sit back and watch the fireworks! Learn more about the dashing detective Herlock Sholmés and the mysterious Finis in the continuing sagas involving the newest men in the Code Realize universe. Cantarella, the mysterious young lady Cardia met during one of her many adventures, gets her turn in the spotlight. Join Cantarella as she gets caught up in the chaos that always seems to surround Lupin and his gang.